Renovating rather than razing has come of age in Newark, offering an alternate option for rebuilding the city. What’s more, this concept of putting new wine in old bottles has been so successful it probably will last. So expensive is building from scratch, more buildings than ever have been renovated rather than rebuilt. Europeans learned this lesson after the Second World War, and we are now beginning to feel comfortable with it as well, whether it is adapting a building by an individual, renovating a former industrial complex, or breathing life back into tired residential sections of the city. Two important restorations of historic houses have followed this path—the North Ward residence of D.J. and Elizabeth Henderson and Emilio Serio’s Houston Street home in the Ironbound, once a church and tinsmith shop. In the 1950s, the Hendersons purchased what is thought to be the oldest extant private residence in Newark, the Sydenham House. In an interview some years ago, D.J. Henderson said theirs was one of the first, if not the earliest, renovations of a house in the entire city. When the Hendersons bought the property, it was in very poor condition with a leaky roof, ceilings full of squirrel nests and birds and a Colonial chest that had fallen through the top room floor into the cellar, with only its top showing above the floorboards. The rubble stone front wall had collapsed into one of the front parlors, and many of the original window panes were broken or their casements needed replacing. The elderly sisters who once lived there were literally huddled in one of the remaining habitable rooms. But the house’s ridge pole was stable, and during the next quarter-century the Hendersons had the stone masonry walls rebuilt and reinforced, replaced the roof with authentic wooden shakes and period leaders and gutters and reglazed hundreds of early glass panes. They used more than 150 gallons of linseed oil to remove more than two centuries of paint from the original pine wainscoting and woodwork. Gradually, the building’s 18 rooms were brought back to their original Queen Anne-era condition. Contemporary furniture and rugs were purchased from around the country to decorate the interior. Period china, cutlery and interior decorations adorned the house throughout. The first floor again took on the feeling and spirit of a prosperous North Newark pre-Revolutionary War farmhouse. Its kitchen was stripped of its late Victorian mask. The Colonial beehive oven was repaired, and the huge kitchen fireplace continued to be used in cold periods as a supplement for heat until D.J. Henderson’s death in 1997. Other rooms on the first floor include a large dining room with its handmade wooden chandelier and a table that seats 10 people. The rest of the floor is given over to three parlors, each with its own fireplace and unique character. The pump room in the rear of the house is decorated with dried herbs, and its walls are filled with glassware and liquor bottles. That large cabinet that had fallen through to the basement now rests in its rightful place, and decorative farm implements of long ago enhance the walls. Two staircases connect the floors. Upstairs, a series of small bedrooms look out through narrow garrison-type windows. Included is a dressing room off the master bedroom and a broadcast and trophy room. The trophy room is full of awards and commendations for the restoration. The most unusual room is the SWIM room, an acronym for sewing, weaving, ironing and mending, since Betty Henderson was a master weaver and two looms once occupied that space. In her will, Elizabeth Henderson leaves the house to the Newark Museum. Surrounding the Houston Street gallery is a disarming English country garden boasting all types of perennials, tiny statuary, cherry and catalpa trees, little white orchids, phlox, marigolds, salvia, pansies, petunias, geraniums and plenty of lettuce for fresh salads. When I conduct tours of Newark, I always find it amusing to watch the expressions on visitors’ faces when they see the garden. 'This is Newark?,' they ask. Well, yes it is, and is that really so surprising? Renaissance Towers, at Mulberry and Market streets, was originally one of the homes of the prestigious Newark Evening News . Founded in 1883, the News became the state’s most important newspaper. In 1970, the newspaper was purchased by Media General of Richmond, Va. Within two years, a prolonged strike and the loss of readers and advertisements spelled the death of the city institution. What was to be done with the building? A solution rested with four developers: Sydney and Arthur Engel and Sol and Lewis Henkind. The answer was the conversion of the 11-story office structure into a 137-unit condominium. Twenty-four hour security, a health club, a sculpture garden, the 'Press Room'—a clubroom complete with party kitchen, high ceilinged apartments, artist’s loft-style space, and a mauve, gray and silver interior lobby with plants and a waterfall—provided a comfortable environment for the condo owners. Some bought their units while others rented. Ample parking is available both above and below ground. Prices for the loft-style units originally ranged from $110,000 to $245,000, which may have inspired the mayor to comment: 'We need housing in Newark for all people: low-, middle-income as well as for the caviar-eaters too.' This project, like Tiffany Manor, was aimed at an upwardly mobile community. Without question, it is one of Newark’s premier residential complexes, a virtual oasis in the heart of the city’s downtown business district. In 1977, Newark’s first official landmark district was created, bringing together a mix of residential, cultural, religious and commercial constituencies. The 20-block, 65-acre area lies between Orange and Bleecker streets and runs from Washington Park west. The mixed-use area includes some of Newark’s and New Jersey’s most prominent cultural and religious institutions, but also has a large residential area once prized for elegant houses. Within its boundaries are Washington Park, the Newark Library and Museum, and St. Patrick’s Pro-Cathedral. Yet 18 percent of the area is devoted to residential use. Important rowhouses can be found among James Street homes. The district also includes Fewsmith Mansion on Central Avenue, townhouses on High Street and the historic Polhemus House on Washington Street. The historic Lloyd Houses, the old example of working-class housing in the city, were demolished more than a decade ago. Other important buildings in the district include the old American Insurance Co., now Rutgers Law School; the massive St. Michael’s Hospital; Eberhardt Hall, once the Newark Orphan Asylum and now the administrative offices of NJIT; and the U.S. Veterans Administration building. In recent years, the restoration of the James Street townhouses has continued after several interruptions. Fortunately, an almost unbroken row of High Street (King Boulevard) has not given way to further intrusions, and town and gown struggles between full-time residents and college students who live in the area have softened in recent times. A very successful venture in Newark housing was undertaken by St. James Community Development Corp. in 1992 as part of the Newark Episcopal Diocese outreach program. When the old stick-style St. James Episcopal Church on Broadway burned several years ago, it was decided to replace it with new housing instead of a new church building in an effort to revitalize Broadway. As a result of new construction on the spot where the church was located, St. James Square was created, providing 22 units, each with either two or three bedrooms. Subsequently, the corporation gutted and completely renovated 10 rowhouses on North Broad Street behind what was once the Newark Normal School. 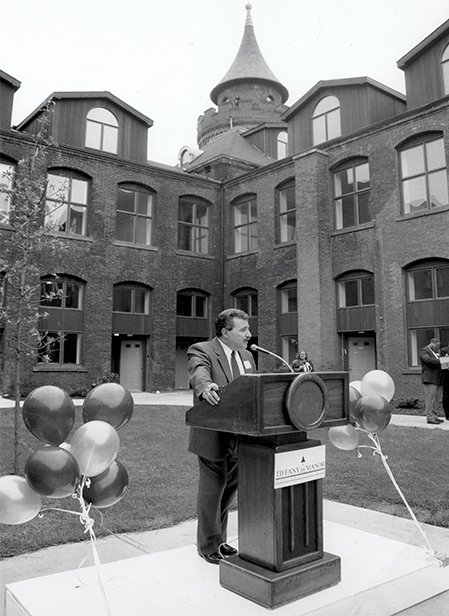 By 1996, the $4 million project was completed and 30 units of affordable housing were ready for occupancy, helping to further stabilize the North Broad Street corridor. At the dedication, these buildings were added to the National Register of Historic Places. One-, two- and three-bedroom apartments were available with areas from 900 to 1,250 square feet. Nineteenth century elegance was reflected in individual apartment fireplaces and moldings. In the near future, 30 new townhouses are to be built between Broad Street and Mt. Pleasant Avenue, with three bedrooms and hardwood floors, in the price range from $55,000 to $92,000 per unit. The St. James projects did not end simply with new housing. It also includes an elaborate program to educate newcomers to home ownership through a series of workshops, block associations and other vehicles to teach maintenance, finance and general upkeep. The assumption was that even the best homes would soon deteriorate into new slums if their occupants were not prepared for the responsibilities included with ownership. If you face west across Broad Street from the Rodino Federal Building, you would see practically every type of housing that American cities have produced. Next week we will continue our review of Newark’s housing cornucopia from the 17th to the 20th centuries.